Ralph is Ombud for the Americas region. He was appointed to the role in 2012 to serve our colleagues around the region – regardless of job function – as a confidential and impartial discussion partner and sounding board. Ralph is available for any Firm member who may have concerns about work-related or personal issues. 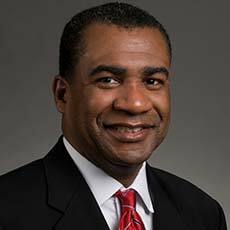 Ralph began his McKinsey career as a consultant in the Cleveland Office from 1992 through 1997. He left McKinsey in 1998 to become General Manager of the Cuyahoga County (Cleveland) Welfare Reform Agency. In that role, Ralph built and ran the 750 person agency that developed and executed the plan which helped 27,000 families move from welfare to work. He rejoined McKinsey in 2001 as the Director of Professional Development and Administration for the Americas Operations Practice, one of the Firm’s largest functional practices. He held this role until 2008 when he became the Director of Operations and Administration of the Firm’s newly established Social Sector Office (SSO). In both of these roles, Ralph oversaw all administrative functions (recruiting, human resources, professional development, finance, and knowledge management). Ralph started his professional career as a co-op student at General Motors Corporation while pursuing his degree in engineering. He worked a total of ten years at GM, the latter four years as a manufacturing area general supervisor. Ralph received his MBA from the Ross School of Business at the University of Michigan in 1992. While at RSB, he was President of the Business School Student Government and Parliamentarian of the Black Business Students Association. Since graduating, he has maintained his connection to the School. He served as Chair of the RSB Alumni Board of Governors, Chair of the Annual Fund and recently completed several terms on the RSB Dean’s Advisory Board. He currently serves as a Board member of the UM Alumni Association Board of Trustees. Finally, Ralph is a frequent speaker to MBA classes, and student and alumni groups. Ralph holds Bachelor degrees in Industrial Engineering from Kettering University and Business Administration from Aquinas College. Ralph, his wife Lisa, and their children, Janae and Cameron, live in Cleveland. He is an Ordained Deacon and an Associate Minister at Mt. Olive Baptist Church.